Although I’d heard some buzz about Scaredy Squirrel ever since I began thinking seriously about kids’ books, I had not read the book — or more importantly, heard it read aloud — until this spring. On a car ride to a local nature center, where we hoped to observe southern flying squirrels, a friend gave my daughter a copy of the book and read it aloud to everyone in the car. I can’t tell you how much I love flying squirrels. My mother, a wildlife rehabilitator, raised some orphaned flying squirrels when I was a kid, and I was fascinated! Since then, I have worked at a wildlife center that cared for flying squirrels (among other species) and I’ve been lucky to work on a campaign to protect flying squirrels on mountain-tops hundreds of miles away. It was because of this last experience and regular discussions about it at the dinner table that I’d decided my daughter had to experience flying squirrels for herself. I thought it was pretty cool that our friend had found a squirrel book for such an occasion. As we drove, she read the book, describing Scaredy Squirrel, and most importantly his routine, which (as you’d expect for a scaredy squirrel) chiefly consists of eating nuts and enjoying the view, all from his tree of course. We laughed aloud at the scared little squirrel, who is so unlike the gray squirrels we observe in the city. And then the story took an unexpected twist. Startled by a killer bee, Scaredy Squirrel propels himself from the safe haven of his tree and discovers that he is a FLYING SQUIRREL! We delighted in Scaredy Squirrel’s glide on the drive that evening, and when we arrived at the nature center, we had the great fortune of observing wild flying squirrels glide down from the trees at dusk. It was magic. I highly recommend this book for kids ages 4 to 7. 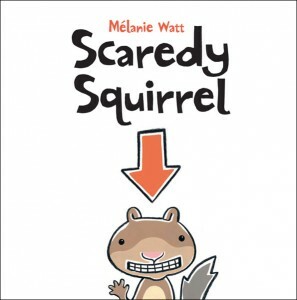 One quick postscript: In re-reading the book, I noticed that sardines are depicted in Scaredy Squirrel’s emergency pack. This is one of my favorite books of all-time. Melanie Watt is a genius. Thanks for choosing to write about this gem! Debra, she is a genius! How do you like the other books in the series?